That’s the big take-away from today’s report from the Bureau of Economic Analysis that the seasonally adjusted real value of the nation’s production of goods and services grew at a 3.2% annual rate during the first quarter of 2010. But the details behind today’s report suggest that the recovery so far remains pretty weak by historical standards. The new GDP numbers allow us to update the Econbrowser Recession Indicator Index for the preceding quarter (2009:Q4), which now stands at 7.7%, a definitive signal that the recession is over. This number comes from a pattern recognition algorithm for dating business cycle expansions and contractions that waits one quarter for data revisions and clear trend identification before making an assessment. 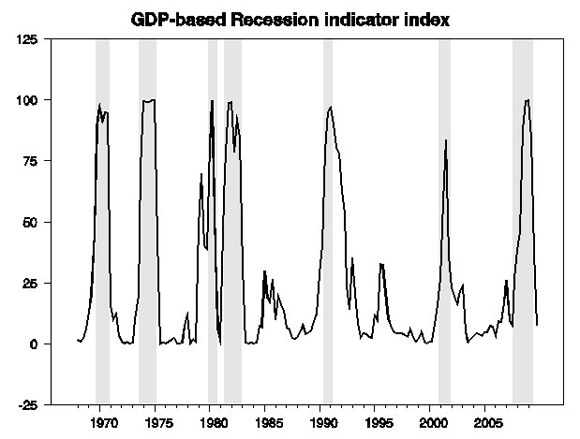 Following our predetermined rule, once a clear signal of a new business cycle phase has emerged, we use the full history of data available as of that date (April 30, 2010) to assign a most probable end date for the recession. These calculations determine that 2009:Q2 was the last quarter of the recession and that the expansion began with the third quarter of 2009. The plotted value for each date is based solely on information as it would have been publicly available and reported as of one quarter after the indicated date, with 2009:Q4 the last date shown on the graph. Shaded regions (with the exception of 2007:Q4-2009:Q2) represent dates of NBER recessions, which were not used in any way in constructing the index, and which were sometimes not reported until two years after the date. The most recent recession is shown on the graph as ending in 2009:Q2 for reasons indicated in the text; as of this writing the NBER has not yet assigned an end date for this recession. 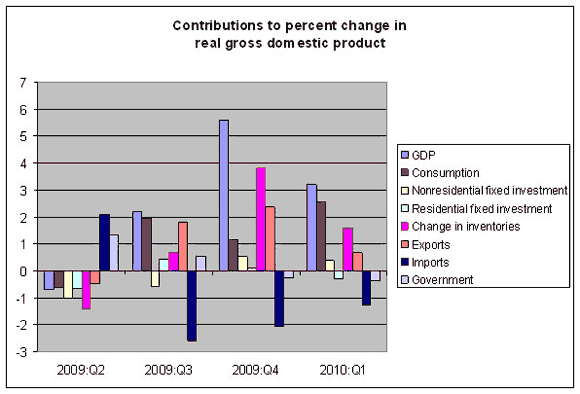 Nevertheless, the details behind the 3.2% growth for 2010:Q1 are disappointing. Half of the growth came from the fact that firms were no longer drawing down inventories and have started to rebuild them slightly; real sales of final goods and services only increased at a 1.6% rate during the quarter, which would be an anemic rate in normal times and is particularly disappointing at this point in a recovery. And even 3.2% growth in GDP may not be enough to make progress in bringing the unemployment rate down. Spending declines by state and local governments subtracted half a percent from the GDP annual growth rate, and residential housing another third of a percent. Nonresidential fixed investment and exports made modest positive contributions to first quarter growth, but I’d really like to be seeing them contribute much more. But I suppose an optimist could see in all this the potential for much better numbers to come once the recovery gets on track. And even if growth of real final sales remains tepid, Inventory restocking could continue to make a big contribution to GDP growth the rest of this year. As usual, check out the always-helpful survey of alternative viewpoints compiled by Phil Izzo. The banks have put us behind the 8 ball, it won’t be years until we are out of this. If you are under the impression that the people are to blame for this, like some are (http://www.weltbranding.com/blog/) then I think you need to reevaluate your stance. This is ridiculous. Let’s go ahead and say hello to hyperinflation.